Time is the great equalizer: we all start off with the same 24 hours each day. What differentiates us from each other is how efficient and productive we are. There is no shortage of programs offering to teach you how to manage your time. The problem is that most programs require you to do a variety of �school related� activities. While this works for some people, it is unsuccessful for many. What if you could manage your time better without major changes to your life, or making yet another list of things you �should� have done. 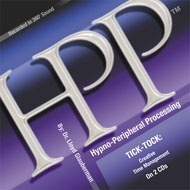 Tick-Tock- Creative Time Management employs Dr. Lloyd Glauberman�s revolutionary HPP programs to program your unconscious with effective time management techniques. In doing so you effortlessly organize your day and become the productive person you are capable of being. With HPP programs, you can expect new goal oriented patterns of behavior to spontaneously appear in your life. You will be more organized and able to stay on-task. Better planning, increased productivity and efficiency are just some of the benefits of a better-organized life. Isn�t it time for you to use time efficiently and productively? Average Customer Review: 1 of 5 Total Reviews: 1 Write a review. I ordered this CD one month ago and it still has not even shipped. (The label has been printed but it hasn't even shipped yet.) Extremely disappointed in this kind of service. Copyright © Hypno-Peripheral Processing (HPP). All Rights Reserved. | Site designed by Vortex Graphics, Inc.